Silverado Contractors’s high-reach excavator and Atlas Copco’s HB 2500 breaker knock out Candlestick Park’s concrete wind baffle. When the permanent residents of Candlestick Park — the San Francisco 49ers and San Francisco Giants — decided to move on to greener fields, Lennar Urban made the return. The Miami-based developer has plans to convert Candlestick Point, the formation which the stadium is named after, and adjacent Hunters Point Shipyard into 700 acres of mixed-use buildings, shopping centers and much-needed housing. But before stores and houses can go up, the stadium had to come down. 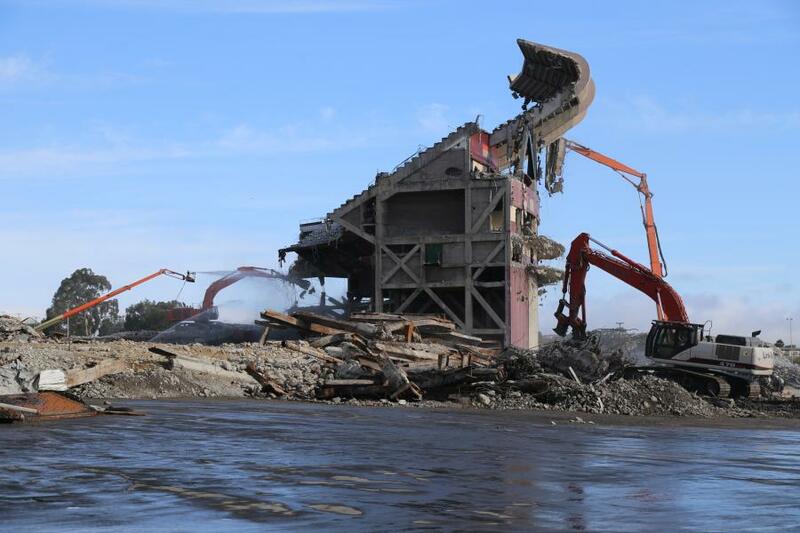 Demolishing Candlestick Park proved to be a unique challenge for Oakland, Calif.'s Silverado Contractors Inc. due to its sheer size, reinforced-concrete wind baffle and thick concrete walls — all features that contributed to the massive responsibilities it once held. Candlestick Park stadium opened as a ballpark in 1960 after baseball's New York Giants moved to San Francisco. It was converted into a football stadium during the 1970s. The stadium housed nearly 70,000 fans during a big game, prevented gusts of wind from blowing field goals and extra points astray, and withstood years of earthquakes, including one measuring 7.1 on the Richter scale in 1989. It was a 132-ft. (40 m)-tall, 630,000-sq.-ft. (58,529 sq m) layer cake of about 96,000 tons (87, 089 t) of reinforced concrete and steel. The original plan detailed imploding the stadium; however, the developer and Silverado had to consider the Bay Area Air Quality Management District's dust exposure requirements and noise concerns from the surrounding neighborhood. That changed the plan, and using excavators fitted with hydraulic attachments became the best solution. 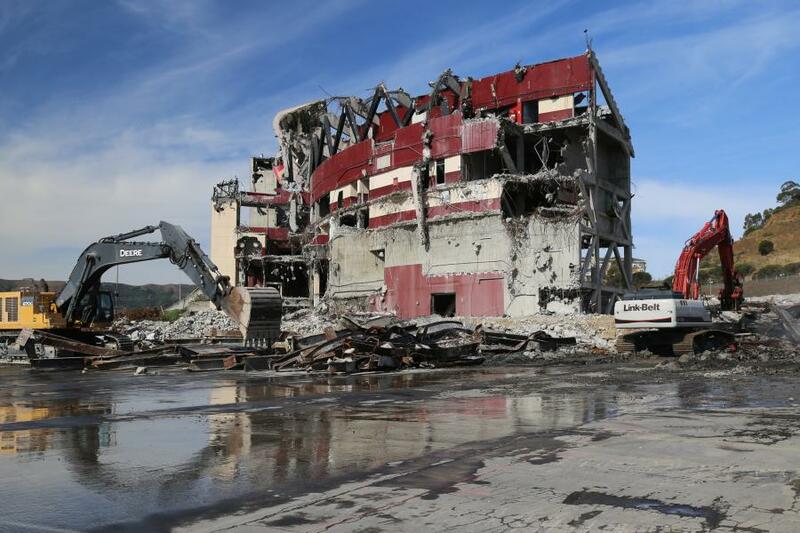 “We've done some seletive demolition of other stadiums in the past, but this is the first time we've ever demolished an entire stadium,” said Andrew Baird, Silverado Contractors project manager. 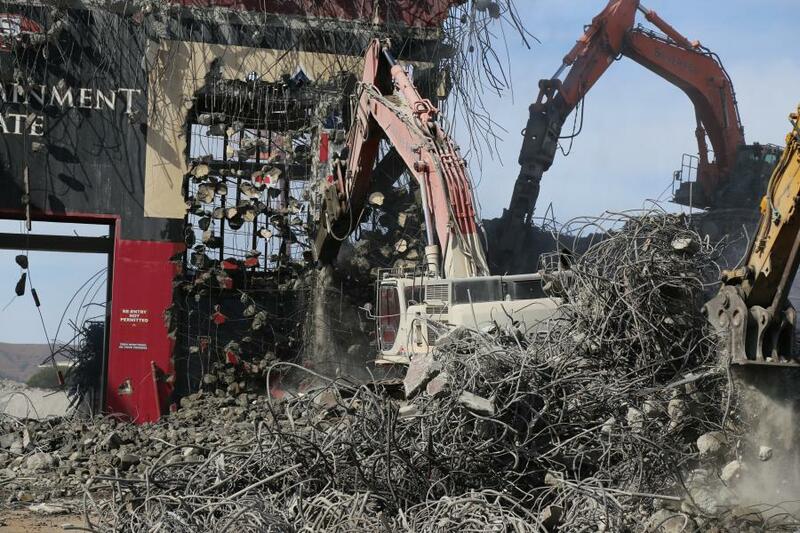 The demolition contractor based in Oakland, Calif. — just across San Francisco Bay —tackles a wide range of projects, from selective demolition to complete building and bridge removal, primarily on the West Coast. “Taking down the structure piece by piece, one section at a time was the only way we could ensure the safety of crews during demolition while minimizing dust,” Baird said. 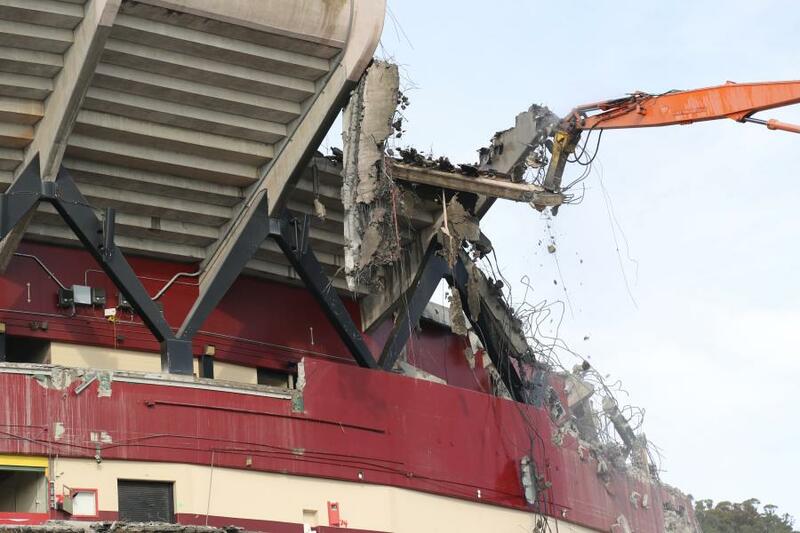 It also was a rare opportunity not many contractors get to experience — the complete demolition of a stadium, which hasn't occurred on the West Coast since Seattle's Kingdome demolition about 15 years ago. But in November 2014, the memory of that project would take a back seat to what was in store for the Candlestick Park stadium. Silverado began the demolition of the stadium by stripping out all 68,500 seats and performing hazardous material abatement, a feat that took several months. By February 2015, Silverado was ready for the next phase of the project: demolition. About 30 laborers stripped and gutted all non-recyclable debris from concession stands, bathrooms and luxury suites. When spring came it was time to bring out the heavy hitters: a team of Silverado equipment operators and several hydraulic attachments, including Atlas Copco breakers. They were ready to face heavy demolition, starting with the stadium's main structure. Before the hard-hitting demolition could begin, Silverado had to ensure everything was in position. Operators using an excavator fitted with a hydraulic shear attachment cut out the steel retractable bleachers, giving the crew access to the field for sorting rubble. Cutting through the steel sections was considerably faster than breaking through a concrete area. It meant they could get onto the field and in position faster, which is why it was a good starting point for Silverado's crew. Once the crew was in formation it was time to tackle the stadium's concrete wind baffle and upper deck as well as its lower reserved seating and boxes. The team of operators used a wide range of equipment and attachments, including aerial lifts, excavators, hydraulic breaker attachments, shears and water sprayers. The play: demolish from top-to-bottom and clockwise from the stadium's southwest corner. “We chose Atlas Copco breakers because they're a proven product, are simple to maintain and have fantastic hitting power,” said Sean Holifield, Silverado Contractors operations manager. Excavators fitted with Atlas Copco HB 2500 and HB 5800 breaker attachments smashed reinforced concrete walls, while another excavator with a hydraulic shear attachment cut rebar and steel supports as they emerged from the crumbling concrete. “We used those breakers nearly all day every day and with minimal downtime,” Holifield said. Both breakers feature Atlas Copco's ContiLube II lubrication system, which automatically greased wear bushings to minimize wear and virtually eliminate downtime from manual greasing, according to the company. The threat of downtime was minimized, but the risk of dust was an ongoing concern, particularly on one of the highest points of the project — the wind baffle. Manually spraying water on the points of impact and debris drop zones would be nearly impossible with a wrecking ball because of its inaccuracy. Using handheld breakers would have been more precise, but put operators in harm's way. The stadium's walls were as thick as 18 in. (45.72 cm) and needed heavy-hitting power to come down. “Dust control was a major concern not only on the wind baffle, but nearly the entire project. And we had to tackle it on two fronts — at the point where we were breaking material and where it hit the ground,” Baird said. Silverado attached spray nozzles to the excavators, which automatically released water to control dust at the tip of the breaker. This ensured excavator operators had a clear view of the work and eliminated the need for manual dust control, which meant crews could remain a safe distance away from any falling debris. Silverado also had operators controlling nozzles on aerial lifts that were set farther back than the excavator, spraying the point where debris hit the ground. For the wind baffle, Silverado called in its high-reach, 76-ton (69 t) excavator and Atlas Copco's HB 2500 hydraulic breaker. The excavator's boom could reach as high as 130 ft. (39.6 m), putting the baffle within the breaker's striking distance and the operator out of range of falling debris. Outside the stadium, the operator pushed the breaker's chisel against the baffle's curved concrete wall and perforated it. With an impact rate of 580 blows per minute, it didn't take long to knock out chunks of concrete and rebar, causing the baffle to sag then collapse onto the upper deck. “Without the breaker attachment, we would have had a real difficult time breaking down that wind baffle while suppressing dust. It would be nearly impossible to get the same control with a ball-and-crane,” Baird said. While work was going on above, an operator using another 76-ton excavator and Atlas Copco's HB 5800 breaker delivered as many as 480 blows per minute to tackle the thick reinforced concrete walls below. They teamed with another excavator operator who was using shears to take out lower seating sections, which also were made of reinforced concrete. “Watching the large breaker work in conjunction with the shear attachment is fairly amazing because what they accomplish together is much more than what any one machine can do on its own,” Baird said. The breaker smashed through external concrete walls and pillars, while the other excavator reached in with its shears and removed the mangled pieces of rebar and steel sheets from the upper deck. “Not only was it less hassle to have two excavators, but it also was more efficient,” Baird said. Because each excavator was equipped with its own attachment — one for breaking and one for cutting — the crew didn't have to stop and switch attachments. They demolished the area from the baffle's peak to the last row, one section at a time, in just hours. As each section came down, another crew moved in to sort rubble. They used an excavator with a bucket to separate twisted rebar from the concrete, and they stockpiled it onsite before crushing it for backfill on the new site or recycling for road building. The crew also sorted and shipped stockpiled rebar and non-ferrous metal for recycling. 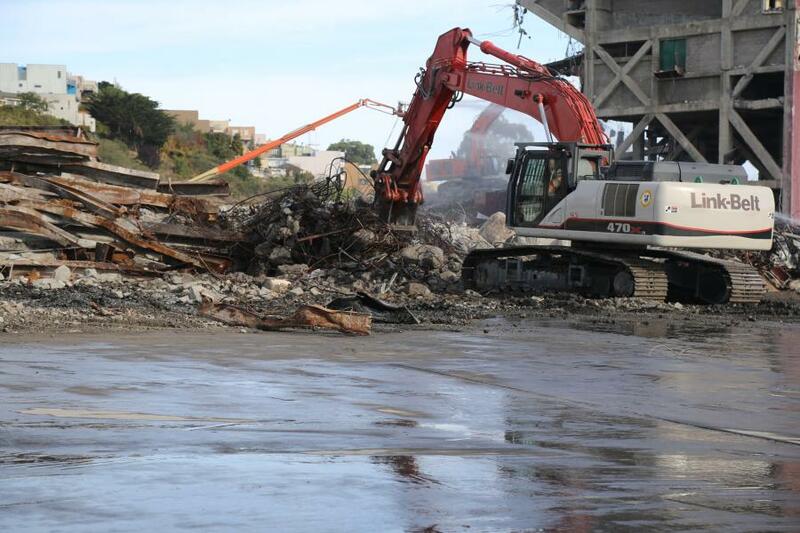 In all, about 98 percent of the rubble from the stadium was recycled. Before finishing demolition in late August, Silverado's crew continued to rely on Atlas Copco breaker attachments to demolish the remaining concrete slabs. They even brought in reinforcements — the HB 4700 and HB 3100 breakers. It's true with football and sometimes it's true with stadiums: what goes up, must come down. 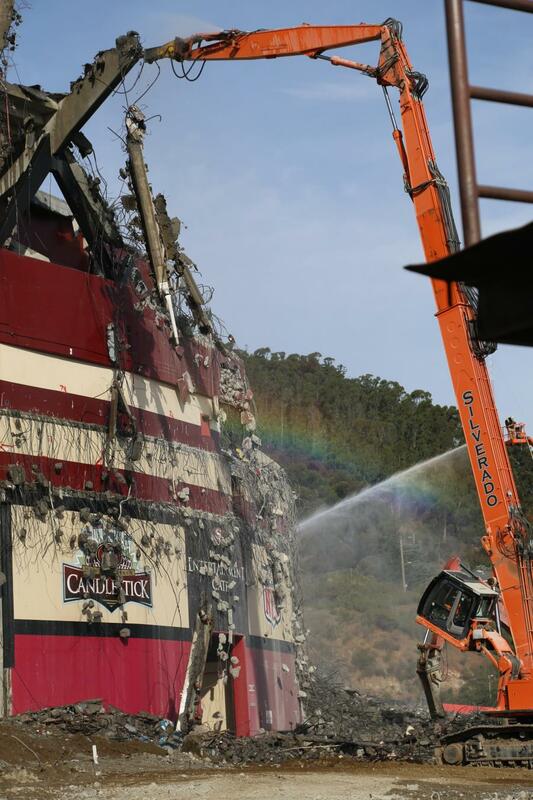 And oftentimes, including the Candlestick Park stadium demolition, gravity is the enemy —from kicking up dust as debris hits the ground to eliminating a fast and easy way to demolish, such as imploding. But there's always a victor who masters the challenge. Just like a winning drive that scores a touchdown, Silverado Contractors ran offense against dust generation and downtime, which ultimately won them the game of safe and efficient demolition.